Rabbit polyclonal SIRT1 antibody. Validated in WB, IP, ICC/IF and tested in Human. Cited in 16 publication(s). Independently reviewed in 7 review(s). Immunogen corresponding to synthetic peptide. Synthetic peptide conjugated to KLH derived from within residues 1 - 100 of Human SIRT1. Our Abpromise guarantee covers the use of ab7343 in the following tested applications. WB Use a concentration of 1 µg/ml. Predicted molecular weight: 81.3 kDa.Can be blocked with Human SIRT1 peptide (ab7770). 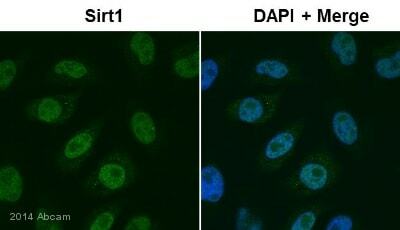 SIRT1 was immunoprecipitated from HeLa nuclear extract. The IP'd fraction was incubated with a histone H4 peptide acetylated with tritiated acetyl-coA, in the presence or absence of NAD+ (the cofactor for SIRT's). After incubation the free label (released acetyl groups) was separated from the peptide. ab7343 (1/200) staining SIRT1 in assynchronous HeLa cells (green). 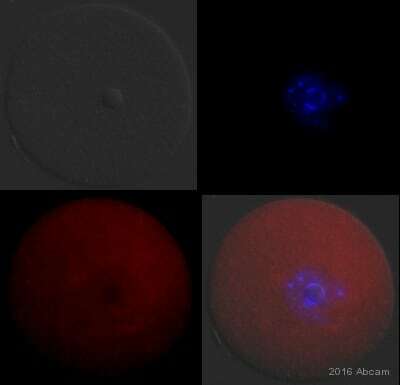 Cells were fixed in paraformaldehyde, permeabilized with 0.5% Triton X100 and counterstained with DAPI in order to highlight the nucleus (red). For further experimental details please refer to Abreview. 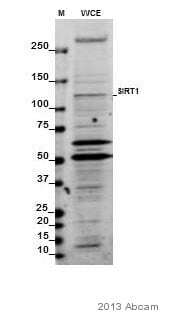 40ug of whole cell extract (over-expressing the SIRT1 protein) is probed with anti-SIRT1 antibody (ab7343). The protein has not been detected in Western blot in HeLa lysates. 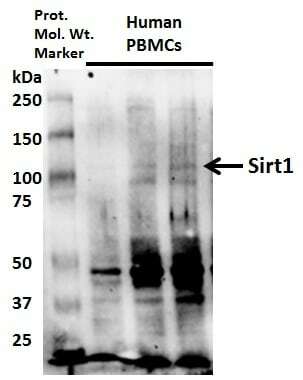 40ug of whole cell extract (over-expressing the SIRT1 protein) is probed with anti-SIRT1 antibody (ab7343). The protein has not been detected in Western blot in HeLa lysates. Publishing research using ab7343? Please let us know so that we can cite the reference in this datasheet. Dear Technical, Your suggestion would suit us really well (I can refund this product and the original shipping cost. You could then contact our customer service group and order both ab7343 and ab18184.) Should I now order ab7343 and ab18184 through your normal Internet order service, or are you able to forward my order based on these e-mails? How much blocking peptide should be used with ab7343. Thank you for your enquiry. For the blocking peptide we recommend using 1 µg/ml. This should be pre-incubated with the relevant antibody for 20 minutes before adding the membrane. If you have any more questions, please contact us again. Thank you for your reply. We are very sorry to hear that your customer is having difficulty with this antibody. We can offer your customer a refund or a credit note, no problem In the past, we had to rely on our customers and external researchers to test this product since we did not have positive control. We have received very good feedback from our collaborators, thus we have been confident that this antibody works properly. Since your customer has been working with SIRT1-stably transfected cell lines, we would like to take the opportunity to ask her for a favour. We would be very grateful if she could test the new batch of this product in her system. Please would you be so kind to forward our request to her and let us know if she would be interested. We are looking forward to hearing from you or from her soon.